Police said Mr Wood was described as "well liked"
A 50-year-old man who was stabbed to death at his home in Lincolnshire has been described as a placid person who "wouldn't hurt a fly". Alan Wood was "a contented, laid back, easy-going and gentle man who worked hard," a family tribute said. He was born in Gillingham but spent most of his life in Lincolnshire. His body was discovered at his home in Lound at about 1300 BST on 24 October. A post-mortem report said he died from a sustained knife attack. He worked as a gardener in his own maintenance business after working for years at his father's printing business. He was married to Joanne Wood, 44, for 17 years, but the couple separated five years ago. Mrs Wood said: "He was the kind of man who would just do anything for anybody". He especially enjoyed live music and beer festivals and would often help out behind the bar. He was an avid photographer. 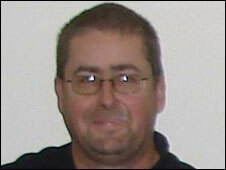 Maureen Wood, Alan's mother, said: "The brutal murder of this gentle man has devastated his family and friends. "I cannot understand why anyone would want to hurt my son. The family and his friends are stunned and shocked."